The beautiful gorge is formed by the river Pennar that runs through the Erramala hills. Our relationship with technology can be aptly described as that of Vikram and Betal's. Whilst it is burdensome on one hand, we cannot do without its company on the other. But amidst the haunting technology, bustling metros, endless traffic jams and numerous deadlines, we all, almost every day make a tiny little wish of being transported to a quaint place nestled between the splendors of nature. One fine day while I was planning to fulfill this wish of mine, I came across something unheard of. 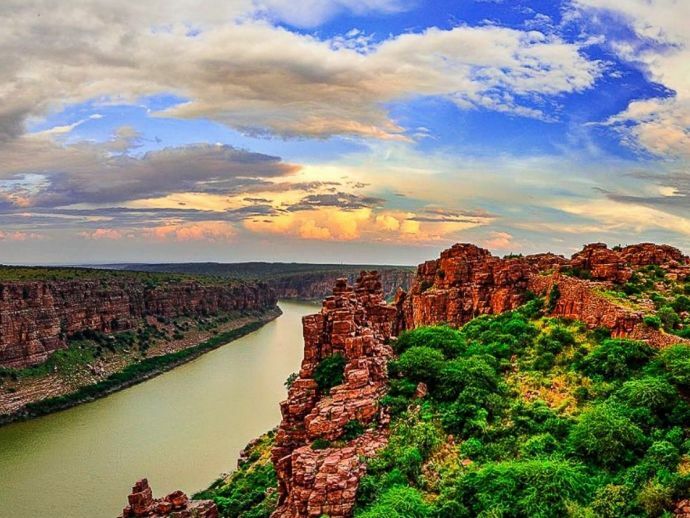 Gandikota - The Grand Canyon of India. Yes, you heard it right. A beauty of a gorge that is situated in the Kadapa district of Andhra Pradesh is something that misses the eyes of many. 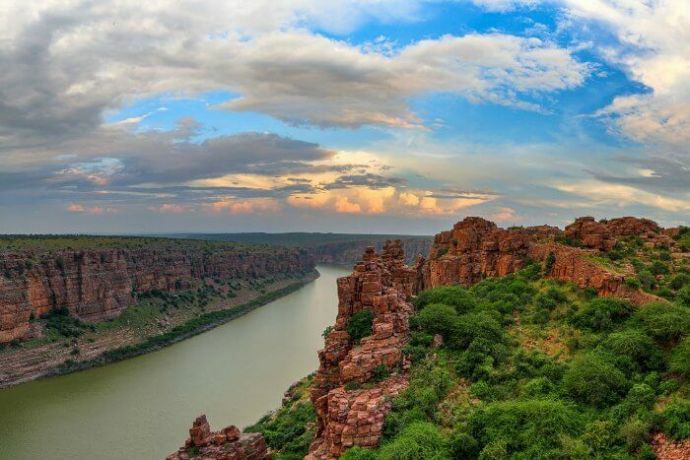 ‘Gandikota’ as the canyon is called is India’s answer to the Grand Canyon of the States. The beautiful gorge is formed by the river Pennar that runs through the Erramala hills. The sight is nothing short of an architectural spectacle created by the nature. 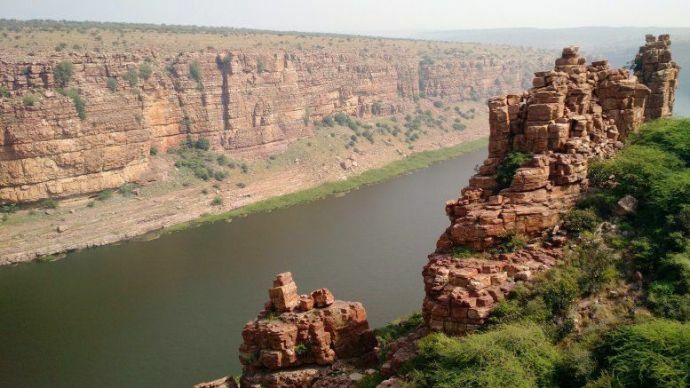 When at Gandikota, you are confused between gaping at the marvelous sight or taking a hike on the finely cut and layered rocks, which by the way is no less than a challenge in itself. But if you make it atop, we guarantee you will be bowled over not just by the striking gorge but also by the stunning Penna river! Ahavamalla Someswara I, the Western Chalukyan king of Kalyana had a subordinate Kapa Raja, who built a sand fort in 1123. The huge Gandikota fort is situated on the peak of the canyon. The walls of red sandstone are replete with elaborate carvings, depicting the vibrant history of the 13th century. Even today, look around carefully and you can see the stories still sitting intact in its ruins. 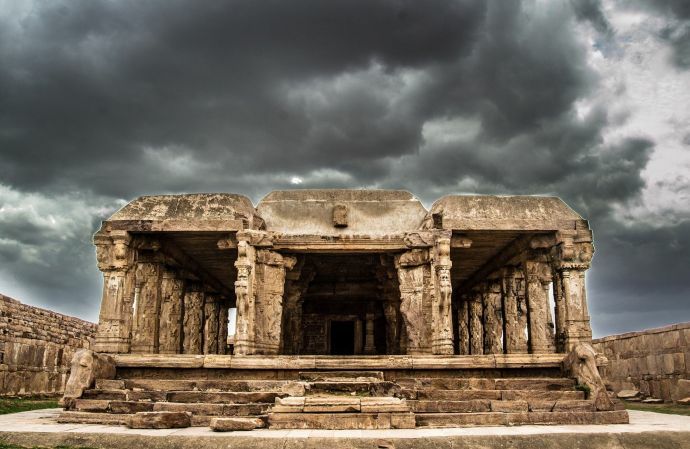 One can also find another architectural phenomenon of the 13th century, a temple of Raghunathswamy in the vicinity. Find as much as you want but you will not stumble upon and idols in the temple. If you’re still not convinced about discovering this beauty, then let me sell you the idea of caving in the caves of Belum, which again bears resemblance to the Antelope caves in Arizona. And how about calling it a day at the Rayalacheruvu Lake? Yes, it’s the same which King Krishnadevaraya has created to draw water from the Pennar river. A camping by the lakeside, watching the sunset and sleeping in the company of canyons and stars is that time of your life that will stay with you for good. 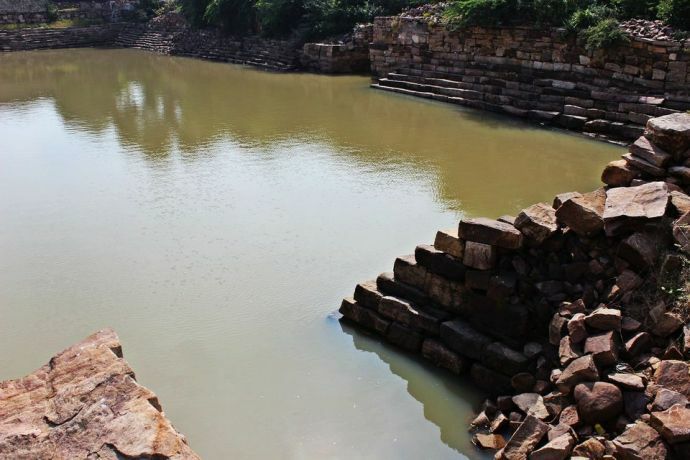 However, since Gandikota is still an unexplored territory, we encourage the masses to engage in responsible tourism and try not the spoil the natural beauty. Pro tip: You might want to drive to Gandikota if you’re in Hyderabad, Bangalore or Vizag, for it’d make for a great road trip!